The giant panda, also known as panda bear or simply panda, is a bear that live in a few mountain ranges in central China. Pandas live in the mountains of southwestern China, in damp, misty forests, mostly at elevations between 1,200 to 3,500 meters (4,000 and 11,500 feet). 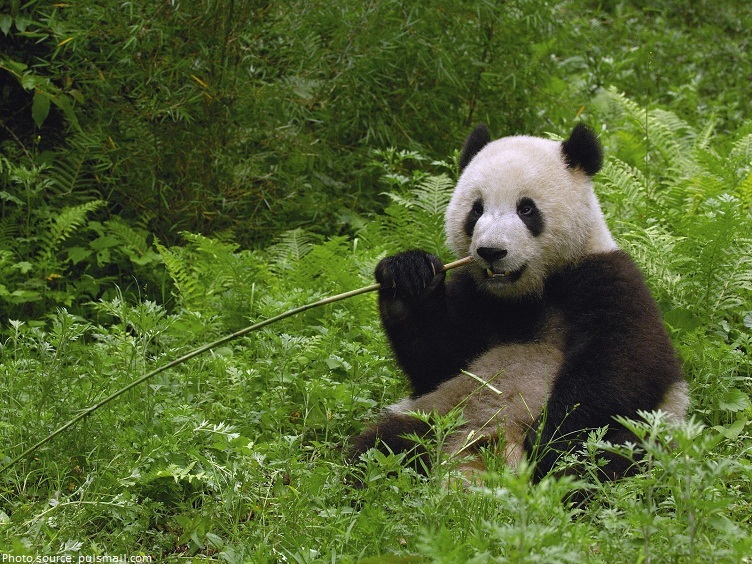 Pandas need old-growth conifer forests with at least 2 bamboo species and water access. Old-growth forest habitat provides old hollow logs and tree stumps large enough for panda dens, and it also provides shelter and nutrients for the bamboo growing there. The average panda’s home range is thought to be about 5 square kilometers (1.9 square miles), with male ranges larger than that of females. 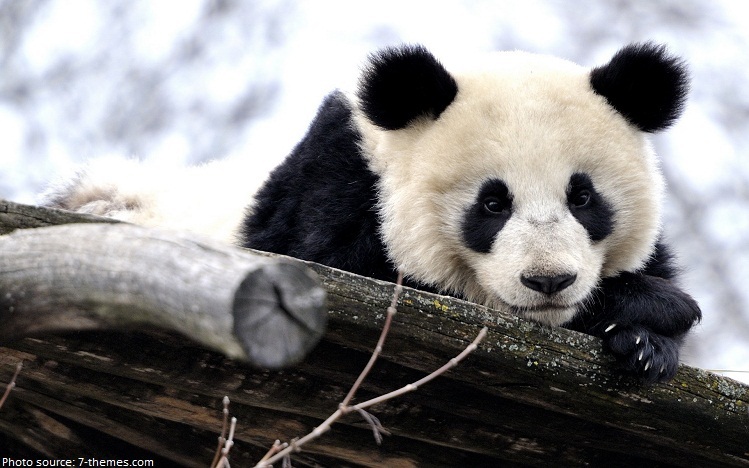 The giant panda is a national treasure in China and is therefore protected by law in its bamboo forest home. 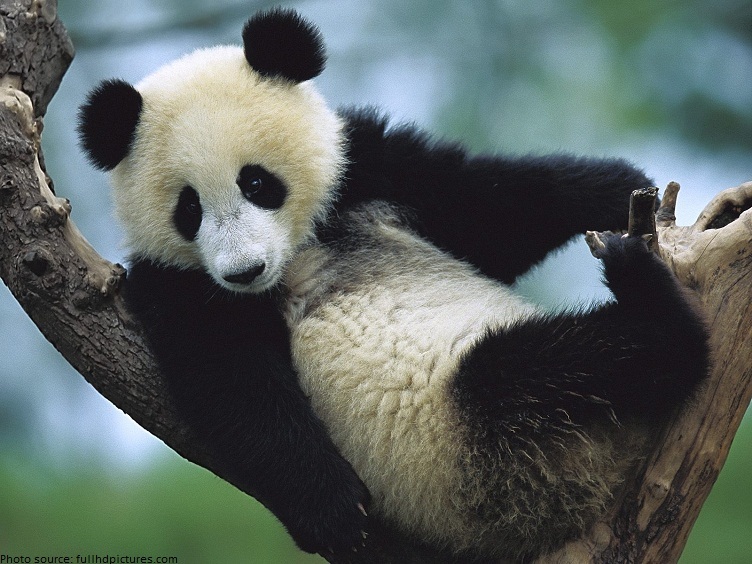 Pandas are by nature solitary animals, for most of the time avoiding direct contact with others of their own kind. The giant panda’s black and white coat and prominent black eye patches have made it one of the best known species, although it is among the shyest and rarest animals in the world. 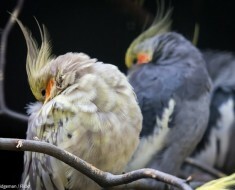 Life span is 14 to 20 years in the wild and up to 30 years in captivity. Panda’s length is about 1.5 meters (5 feet), height at shoulder is from 70 to 80 centimeters (27 to 33 inches). Panda’s weight for females is from 70 to 100 kilograms (155 to 220 pounds) and for males from 86 to 125 kilograms (190 to 275 pounds). 99% of a Panda’s diet consists of bamboo. But bamboo is so low in nutrients so they spend at least 12 hours each day eating it. 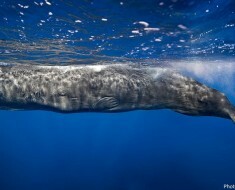 They eat up to 12 kilograms (26.4 pounds) of bamboo daily. 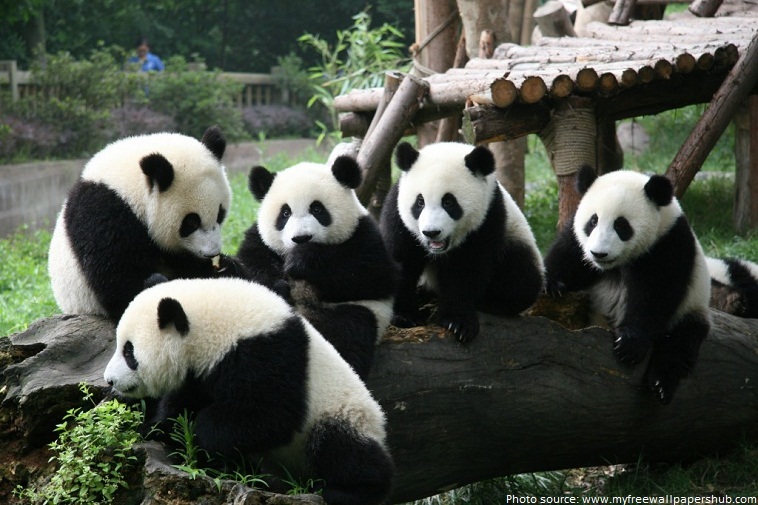 Giant pandas have a slow reproductive rate: mature females usually breed just once every 2 or 3 years. In the wild, a typical female panda may bear about 5 litters in her lifetime. The panda mother gives great care to her tiny cub, usually cradling it in one paw and holding it close to her chest. 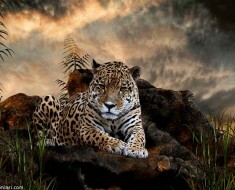 For several days after birth, the mother does not leave the den, not even to eat or drink! 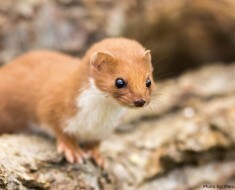 A cub has pink skin, a thin coat of white fur, a long tail, and no teeth. 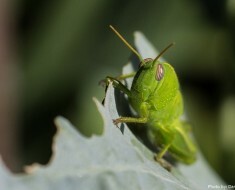 Its eyes are closed. By the end of the first month, the baby panda has all of its spots. Its eyes open around 4 to 6 weeks and teeth appear around 14 weeks. Than mother and cub spend much less time using their den. Cubs stay with their mothers for 18 months before venturing off on their own! Pandas don’t roar like brown bear. They make sounds similar to the sound a lamb or a goat kid would make, and it’s a friendly sound, a greeting. They also honks, barks, huffs, and growls. Panda researchers have counted 11 different panda calls—and four of them are used only when searching for a mate. 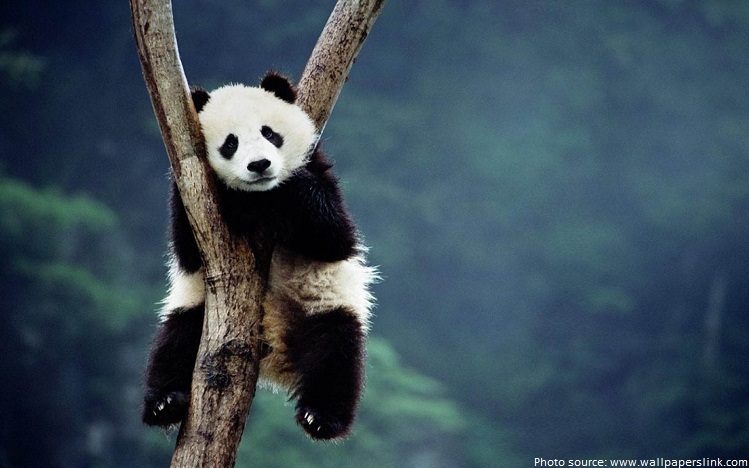 Unlike most other bears, pandas do not hibernate. When winter approaches, they head lower down their mountain homes to warmer temperatures, where they continue to chomp away on bamboo! 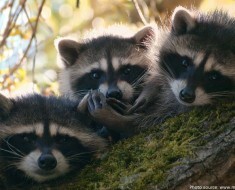 For years scientists have wondered whether pandas are a type of bear, raccoon, or something all their own. Through studying the genetic code (DNA) in pandas’ cells, scientists have confirmed the panda’s relationship with bears. The West first learned of the giant panda in 1869, when a French missionary received a skin from a hunter. A panda fur is worth between $60,000 and $100,000 on the illegal trade market. 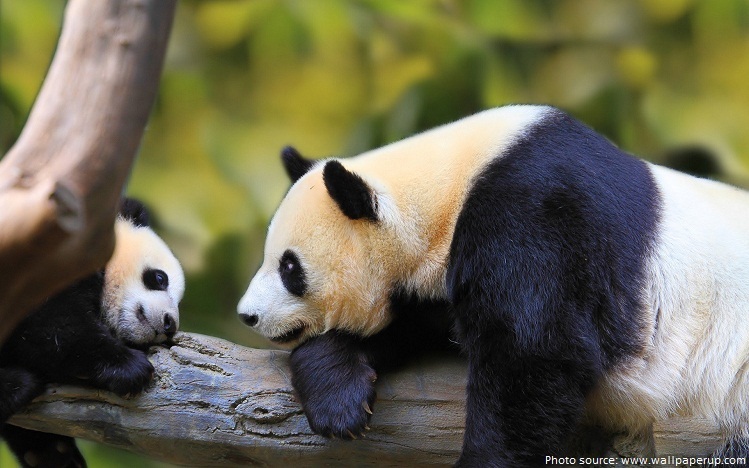 The latest census in 2014 found that there were 1,864 giant pandas alive in the wild. While still very low, this represents a real success story, with numbers increasing from around 1,000 in the late 1970s. All pandas in the world are on loan from China, and when a baby Panda is born, by agreement, it is sent back to China to help expand the gene pool. Panda researchers have to wear panda costumes to work with cubs. One of the reasons the World Wildlife Fund chose the Panda as their logo was to save printing costs. Fossils have been found showing that giant panda bears evolved somewhere between 2 and 3 million years ago. The giant panda’s scientific name is Ailuropoda melanoleuca, which means ‘black and white cat-foot‘.